Amidst rainy weather, the Philadelphia Flower Show opens to the public this Saturday, March 3 at the Pennsylvania Convention Center. After undergoing one of the wettest Februaries on record, it feels fitting that this year's Philadelphia Flower Show takes on the theme Wonders of Water. It also appears somewhat dismally appropriate given the show's saturated history of wet-weathered obstacles. Dating back to 1993, the annual show has suffered through a cumbersome amount of inclement weather, and this year is shaping up to be no different. 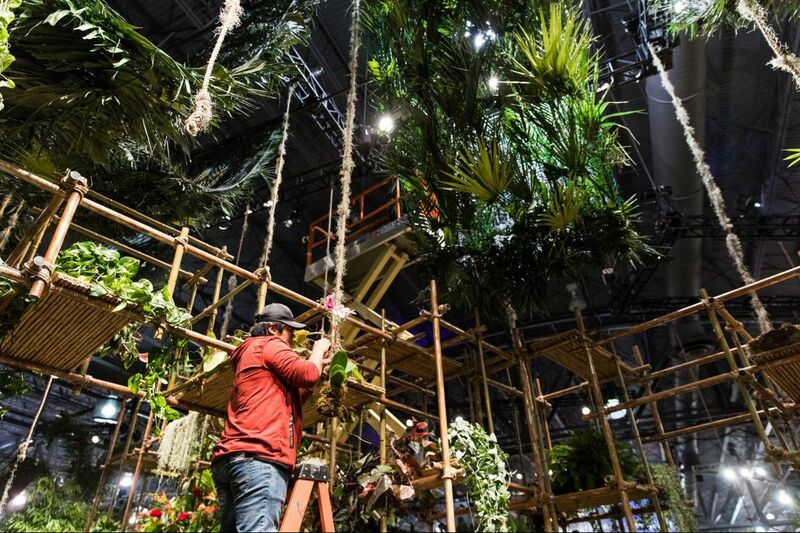 Tonight, the Philadelphia Flower Show will welcome some of its first visitors inside with a massive, 25-foot-tall waterfall — filtering 2,300 gallons of water — at its entrance. As guests dressed in evening wear enter the doors for the show's annual kickoff gala, outside a roaring nor'easter is expected to be at its peak. The storm is predicted to taper off overnight, but ensuing coastal flood warnings are in effect and the kind of winds capable of creating power outages are forecasted to continue into Saturday, the show's official opening day. "The show has encountered weather like this before, but it always keeps its doors open and positions itself as a place to escape," says Kevin Feeley, communications manager for the Pennsylvania Horticultural Society. "This time around, guests will get to escape to the rain forest." Meanwhile, in 2001, Philadelphia meteorologist John Bolaris mistakenly predicted the "storm of the century" during the week of the Flower Show. While the storm dropped a mere two-inches of snow outside of the city — missing Philadelphia altogether — attendance at the show suffered. This scenario repeated itself in 2013, when again, local TV stations hyped up a snowy forecast that never materialized, but did contribute to a 17-percent decrease in Flower Show attendance compared to the previous year. "We're not expecting any real drop in attendance this year, but final numbers will be tallied at the end of the show," says Feeley, noting that the show averages 250,000 visitors annually. Regardless of this weekend's weather, and looking beyond Philadelphia, 2017 as a whole was a strikingly waterlogged year. In fact, last year was labeled the costliest year on record for natural disasters in the U.S., many of which are attributed to H2O-related consequences. The cumulative damage of the disasters — including two flooding events, eight severe storm events, and three tropical cyclone events — amounted to just over $306 billion. It's a startling amount that seeps its way into discussion at this year's flower show. In a special exhibition entitled hereafter, the world's changing ecosystem is examined in the context of its effect on the living environment. Focusing on the positives of events like wildfires and hurricanes, the exhibition looks at the unexpected beauty that can grow out of environmental crises. In a special exhibition at the Flower Show entitled hereafter, guests are invited to examine the unexpected beauty that can grow out of environmental crises. "I approached the idea from a fine art perspective, thinking of this as more of a living art installation, which is a new idea at the flower show," says Christian Kanienberg of WISH Painting + Sculpture, creator of the exhibition in collaboration with florist Mark Harding. "I wanted to create something that would give show-goers a little more pause. They're asked to enter a disaster scene and stop to reflect." At the center of the exhibition are three large vessels — a sailboat, a fishing style boat, and a smaller power boat — on which exotic plants, like Kangaroo Paw Ferns and Lipstick Vine, are seen growing up from the "salvage". Guests are invited to ponder the interplay between damage and beauty that water can create. The Flower Show officially opens to the public tomorrow, March 3 at 11 a.m. and runs through March 11. Fortunately, next week's weather forecast is looking a little brighter with temps falling in the 40s and 50s.